Good evening on this balmy July evening, for another Tuesday review from me. It’s been a while, but Becca is taking a rare day off as she is working up in Edinburgh; possibly in a trial period to see how we cope without her with her impending move to Sri Lanka. So, was it the carnage and anarchy that could be anticipated without our exalted Founder? Well, thanks to Sam, normal autocratic dictatorship was maintained, as 5 film clubbers headed to Finsbury Park for an evening of bruschetta, avocado, the Undead, and Elvis. 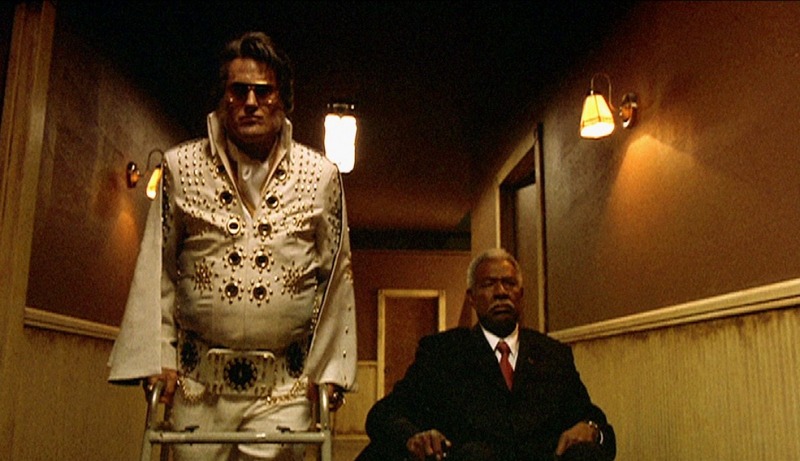 The film shown last night was 2002’s Bubba Ho-Tep, directed by Don Coscarelli (Phantasm) and starring Bruce Campbell (The Evil Dead). Based on the Bram Stoker Award nominated short story by acclaimed author Joe R. Lansdale, Bubba Ho-tep tells the “true” story of what really did become of Elvis. And what did become of The King? Well, if Bubba Ho-tep is to be believed, he wound up residing in a convalescent home in backwater Texas, where he’s forced to fight an ancient, soul-sucking Egyptian mummy alongside an elderly black man who thinks he’s John F. Kennedy. Obviously. With the pitch of the story under our belts, we allowed ourselves along for a ride which we all thought was very entertaining. We were also impressed at Lucy’s ability to cope with an unexpected foray into horror, although the black humour and brilliant one-liners certainly took the edge off any fear. For those fascists unable to attend on Monday, I thoroughly recommend you get this film from Sam who with with this film I am sure would be a contender for the Best Film Quote FAFTA. With echos of B-movie horror, Coen-esque satire and dialogue, and slapstick reminiscent of Father Ted, there was much to be enjoyed in this film. We even managed to chin-stroke about how such an idea for a film could be conceived and the brilliance of it’s absurdity. But we also considered themes about delusions, and about those characters from history that ‘refuse to die’ – in particular in the minds of loyal fans and conspiracy theorists. Indeed, searching for Elvis conspiracies on Google reveals about 3,630,000 results; of which I just skimmed the surface in preparing this Review. But please feel free to search and come to your own conclusions! Then I looked for JFK… and the theorists had created about 8,340,000 results. However, on looking into a few of these sites, they seemed to revolve more around the involvement of the CIA and Castro, rather than anyone suggesting that J.F. Kennedy was in a nursing home with sand in his brain and dyed black, as we were lead to believe in the film! And then to the Mummy. Ho-tep, as was explained to us in the film, translates to roughly “to be satisfied, at peace”. It is regularly found in the names of ancient Egyptian figures. There are famous Ho-teps all over the place, including at the British Museum, and also in this classic film. It turns out that the budget of this film was so tight, less that half a million dollars, that the KNB Effects company agreed to make the Bubba Ho-Tep make-up and costume for cost of materials as a favor to Don Coscarelli. I’m sure we could have done it even cheaper. I’ll leave you with one more link, should any of you need an Elvis impersonator of your own… and let it be testament to the importance of practice and preparation should any of you be thinking of signing up to the new series of Stars In Their Eyes. Special thanks to Jerry Springer in that one, thanks for the memories nightmares. So, that’s all folks. Thank you, thank you very much. Jon has left the building. THIS IS NOT A DEMOCRACY, YOUR SOUL SUCKIN’ DAYS ARE OVER, AMIGO!